Do you sort out all the electricity? Yes. 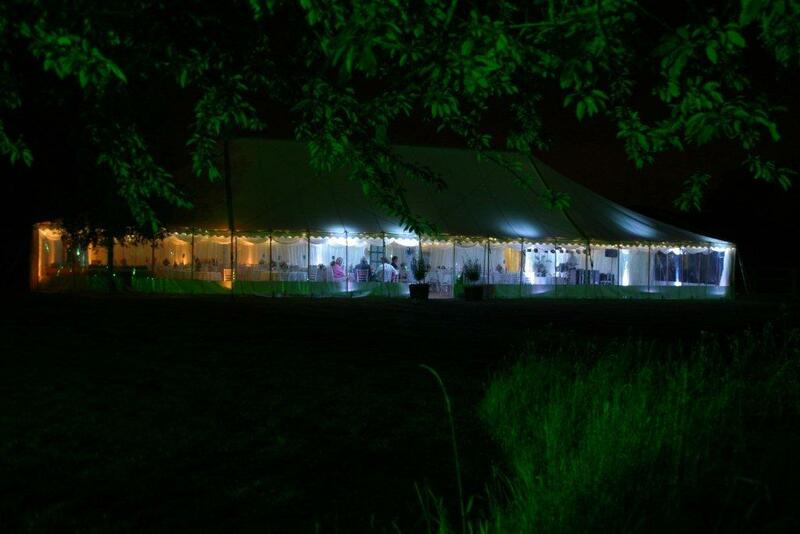 Firstly we will advise you on the safest and most cost effective method of providing power to the marquee – either from 13A sockets in a nearby house, via a distribution board wired into your central fusebox or from a generator (and backup). 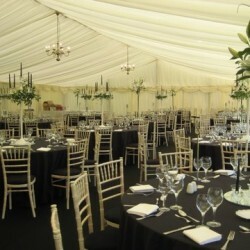 Then we will arrange the distribution of the power to cover all areas – caterers, DJ / band, lighting, toilets and heating. 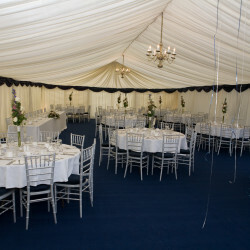 The underlying requirement is to give you, the customer, peace of mind at the most favourable price; in this respect we will always ensure that there is more than enough overall supply such that there is not an overload in the middle of your event, and it goes without saying that all our equipment is regularly safety tested. 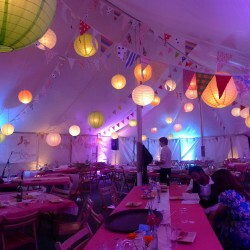 Can you provide a staff member at our event in case of emergency? Yes. Our aim is to take away all the possible hassle and risks for all our clients, and if this gives you extra peace of mind (and indeed an extra pair of hands) on the day then we are more than happy to provide this service at very reasonable rates. Regardless we will always give you an emergency mobile number to call in the unlikely event that anything goes wrong on the day. This person will be available to come to the event immediately. I’m not sure how many people will be able to come to the event. 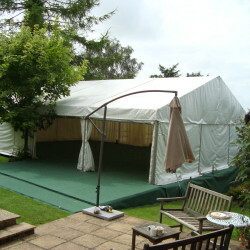 Will this make a difference to the size of marquee and when do I need to let you know? Our experience has taught us that this is usually very important to you. 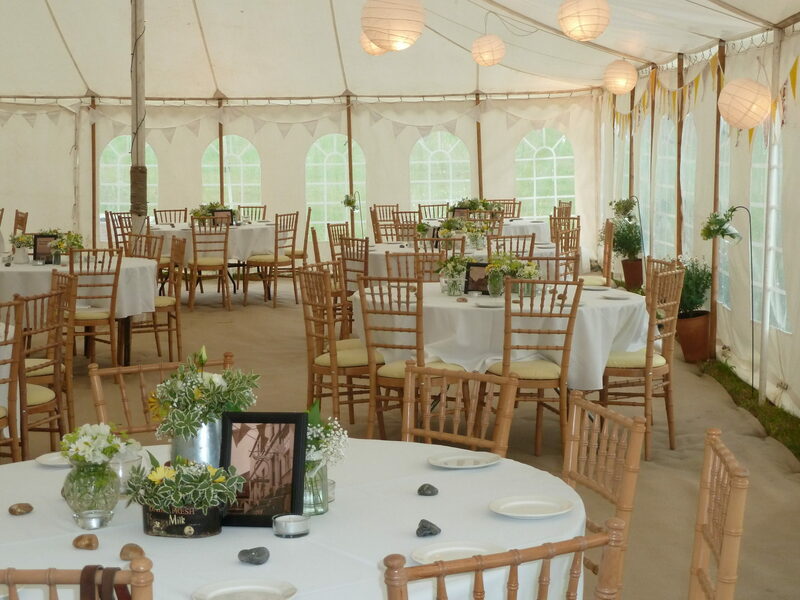 Therefore wherever possible we will offer you the ability to add another section if you think this will work better for you even right up to the last minute. 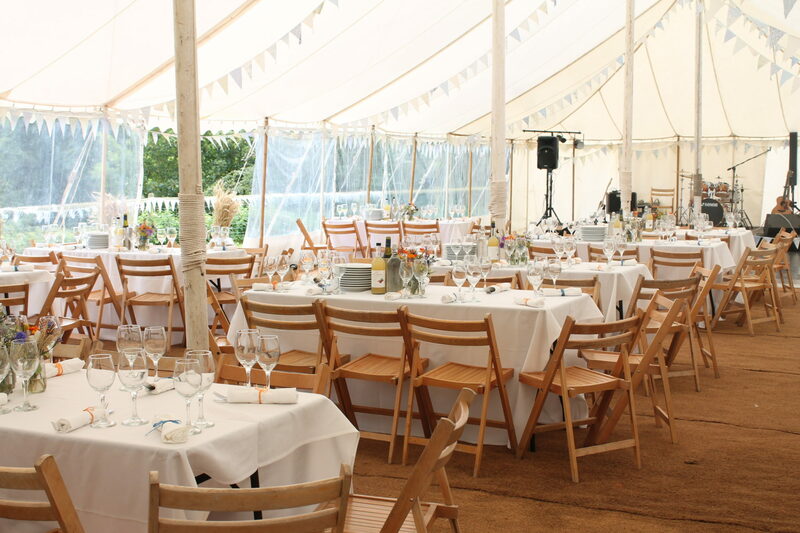 In addition we can remain flexible about the furniture (such as number of chairs, table sizes etc) up to around a week before the event. 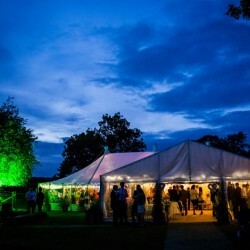 Furthermore we are happy to provide optional extras such as walkways and separate marquees over the toilets if adverse weather conditions demand this at the last minute. We have full Public and Employers Liability insurance. 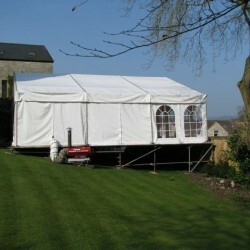 Hence if there is a problem with the structure collapsing or blowing away then we are liable. 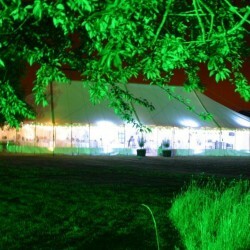 We are not covered, however, for security once we have left a marquee erected on site. 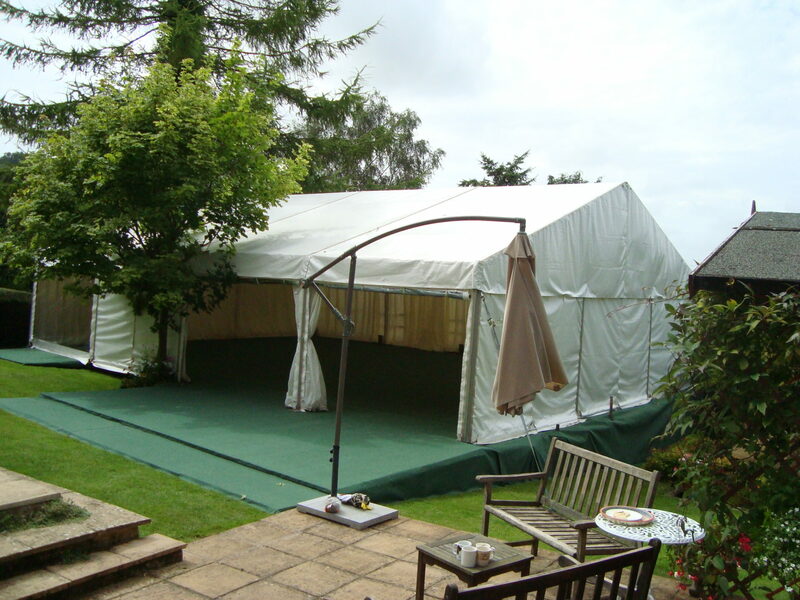 Hence if there is any vandalism, fire damage or theft of a marquee once it is in situ then the liability will rest with the hirer. Some of our clients take out an insurance policy independently, others use security guards but most take this liability on with no adverse effects (or costs!). We always discuss this issue in more detail with clients at a site visit. 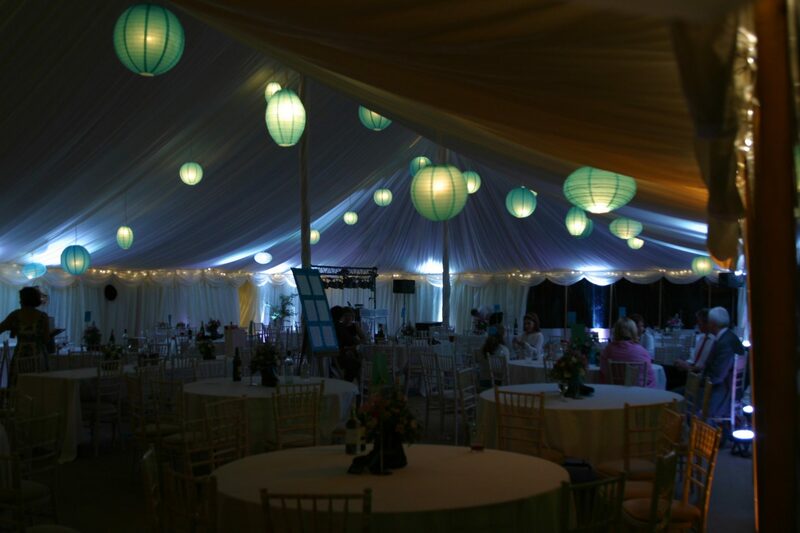 Chandeliers: The most common form of lighting, running along the apex of the marquee and controlled by a dimmer. 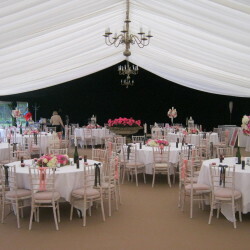 They provide the ‘classical’ feel to a marquee. 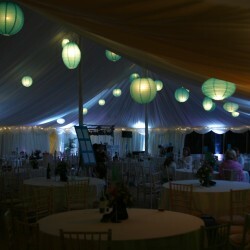 Uplighters: Sit on the floor around the edge of the marquee, shine up at the walls and are also controlled by a dimmer. They provide a more atmospheric type of lighting. 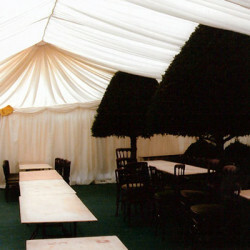 These tend to be more effective at winter events where it is very dark outside and they provide a ‘warmer’ light. As they are on the floor they can easily get knocked – therefore we tend to advise against using them if space is limited. 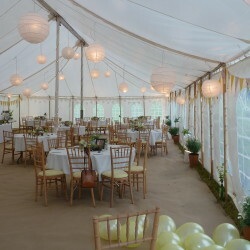 Lanterns: Multi shaped lanterns that hang through the lining to create a completely different atmosphere. Available in a variety of colours. 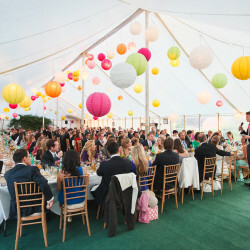 Spotlights: We can provide indoor spotlights to highlight features such as a cake table, a tree or a mirror ball. 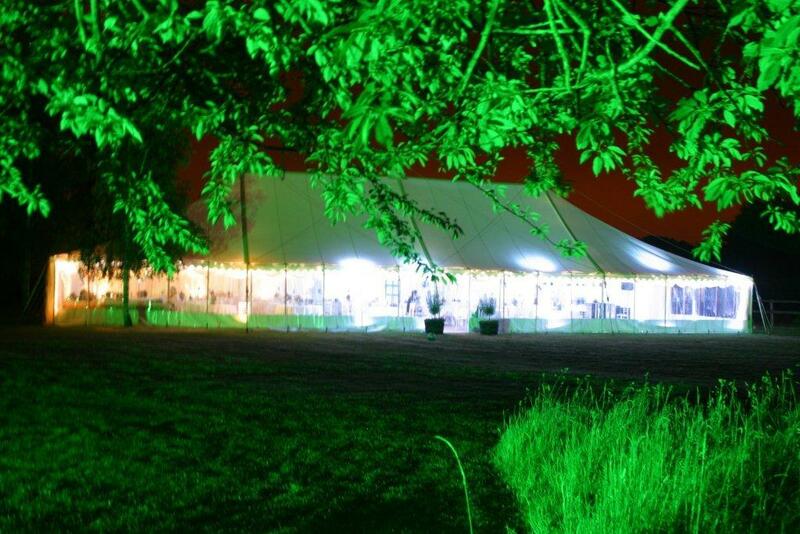 Outdoor Lighting: We use spike spotlights for outside areas and walkways. 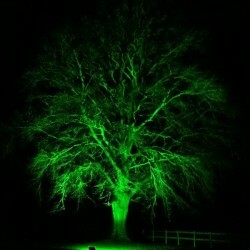 We also provide high wattage coloured MBI floodlights to create stunning effects for trees or buildings. 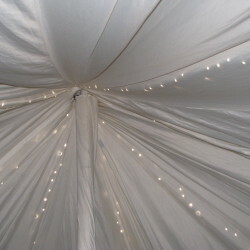 Fairy Lights: We have a large stock of fairy lights that can be used in a number of ways – around the tops of the marquee walls, wrapped around central poles, in flowerbeds or as a cheaper alternative to starlight ceiling behind the lining. What options do I have for the lining? 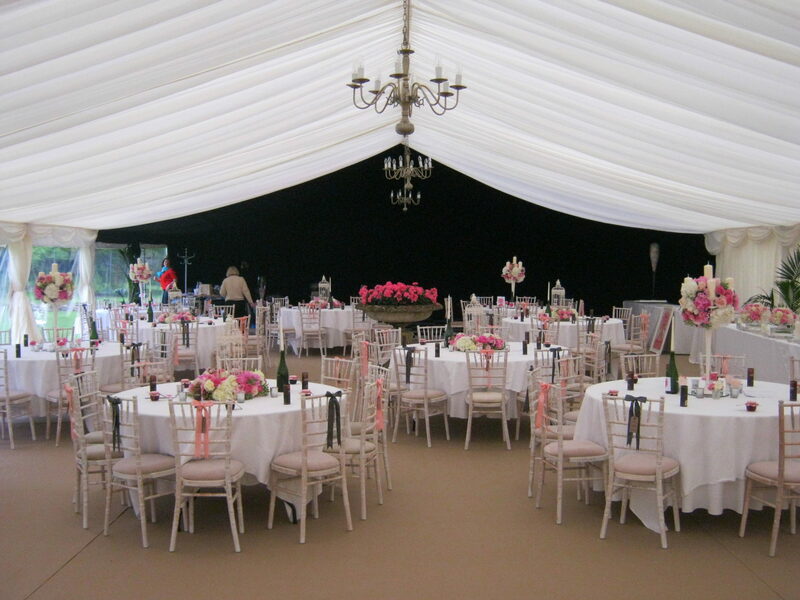 Our standard lining is pleated ivory. 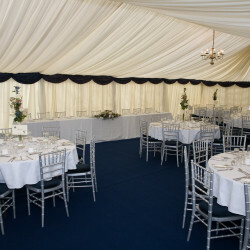 You can personalise your marquee with coloured swags, which come in a huge variety of colours to match your colour scheme, and include ivory (to match the background lining), burgundy, pink, lilac, gold, silver or green. 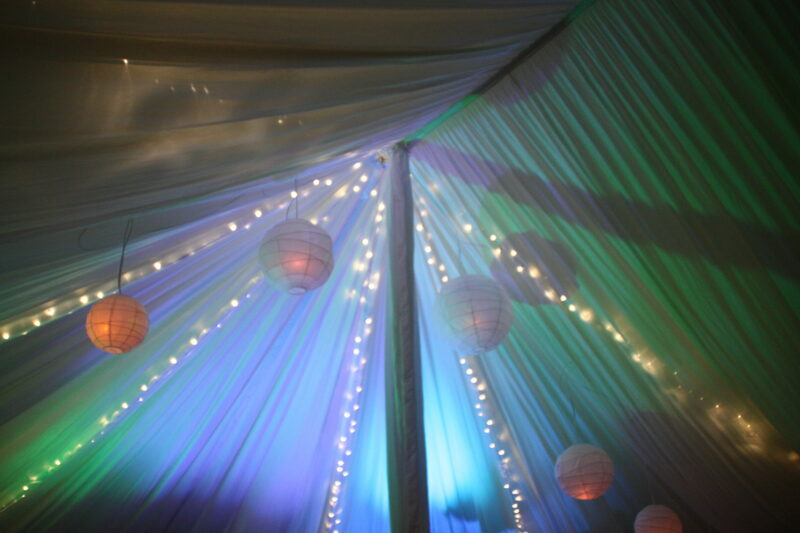 We can also provide complete coloured linings to order, as well as white or black background linings and themed linings such as clouds, jungles, fireworks, mountain ranges or palm beaches. Please ask about additional costs for these items. 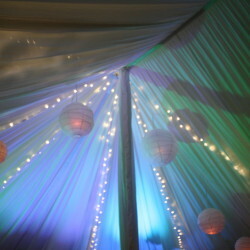 Increasingly popular is a starlight ceiling over all or simply the dancefloor area of the marquee. 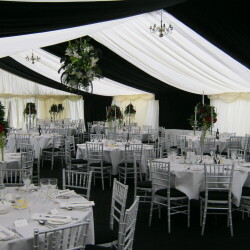 These are black or ivory roof linings with twinkling fibre optic lights. My garden has a slope. Can I put a marquee on it? This all depends on the degree of the slope. 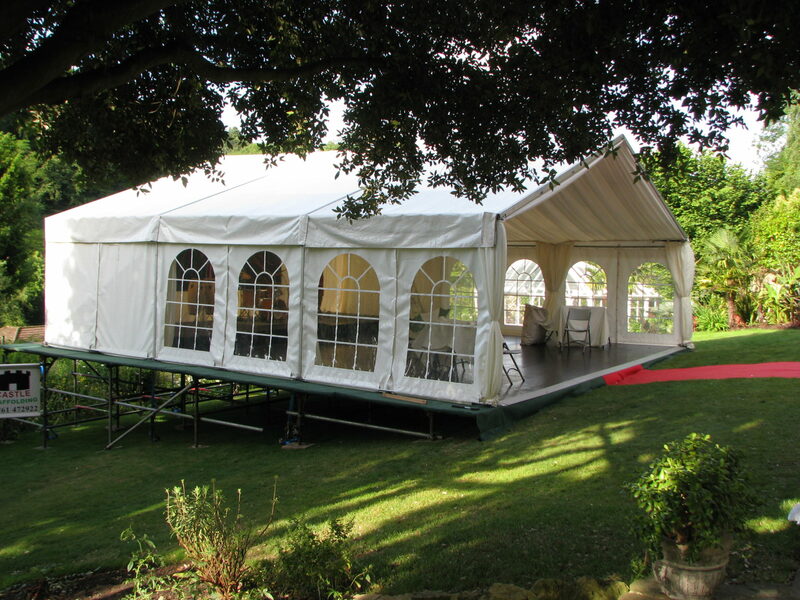 Our Eventfloor can be ‘packed up’ to provide a degree of levelling, generally to incorporate a fall of up to half a metre across a 6m or 9m wide marquee. 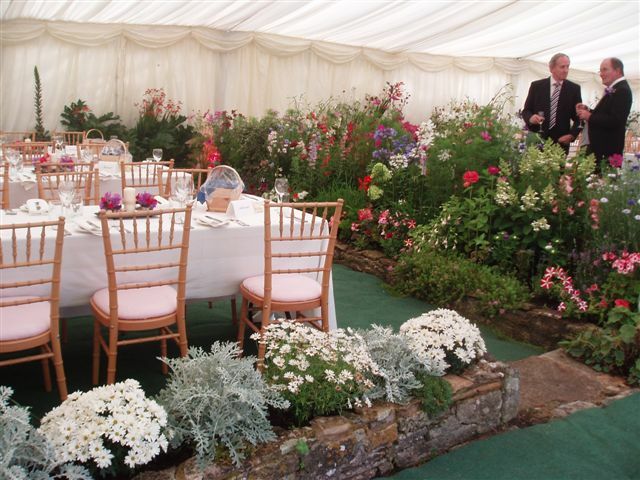 A good test is to put a garden table and chairs on the slope – if they immediately won’t work then you will probably struggle. If you could just about eat a meal sitting at the table then we will probably be able to resolve it. 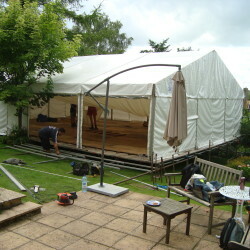 The alternative is for us to install level wooden flooring on scaffolding although this obviously incurs extra costs. 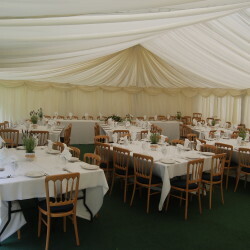 Can you put a marquee on a hard surface such as a patio or car park? Yes, although we still need to secure it to the ground. 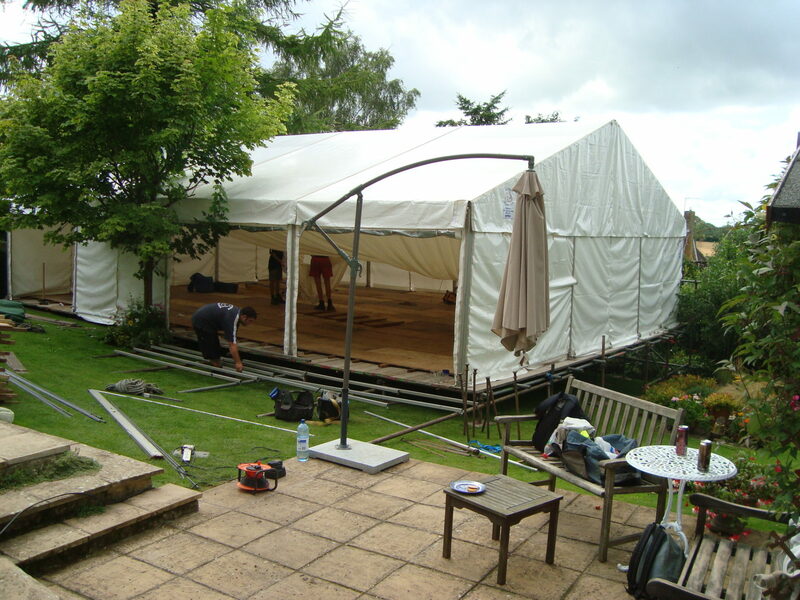 This can be done with guyropes or large waterbutts or alternatively we can drill holes into the patio and screw in heavy duty fixings that hold down the marquee. This obviously depends upon your preferences and the site. Generally these type of fixings are less secure than the traditional stakes so we sometimes take a view depending upon how exposed the site is. 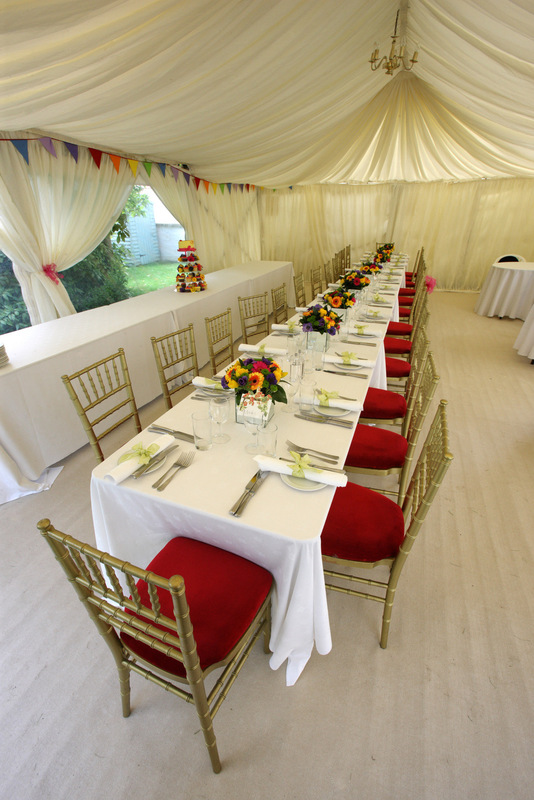 Most clients pay a deposit of between 25% and 50% of the total price to secure any booking. The balance is then payable on fulfilment. 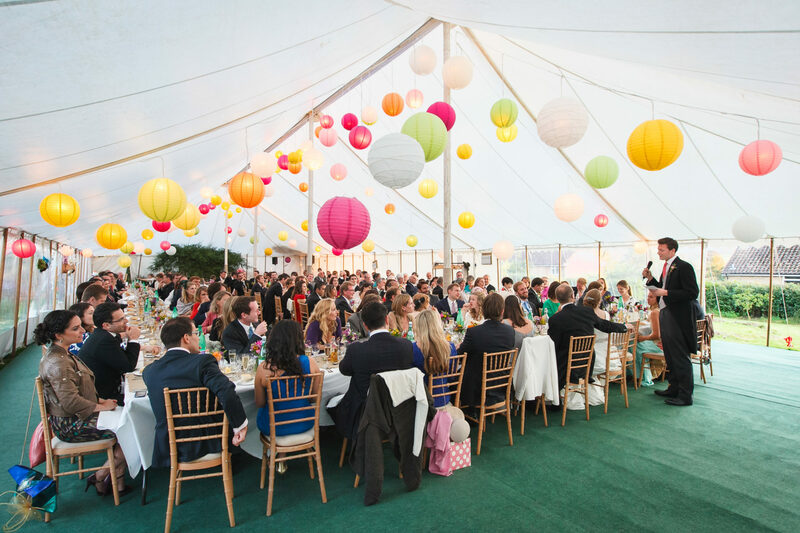 We understand, however, that for an event like a wedding many people are saving up right to the day, so we are happy to defer payment if appropriate. 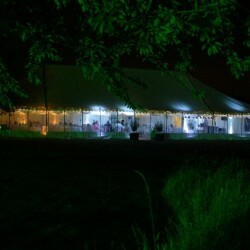 Alternatively we will generally offer a discount if a client pays the majority in advance. Yes, and we are available at evenings or weekends if that suits you better. Can we open the walls if it is a hot day? 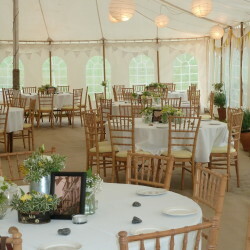 Yes, we either provide window walls or walls that can be opened like curtains at no extra charge. 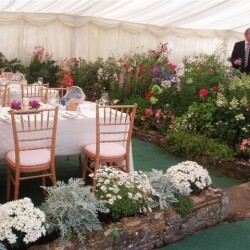 These can be put in any wall of the marquee, which also means that you can create entrances and exits wherever you need. 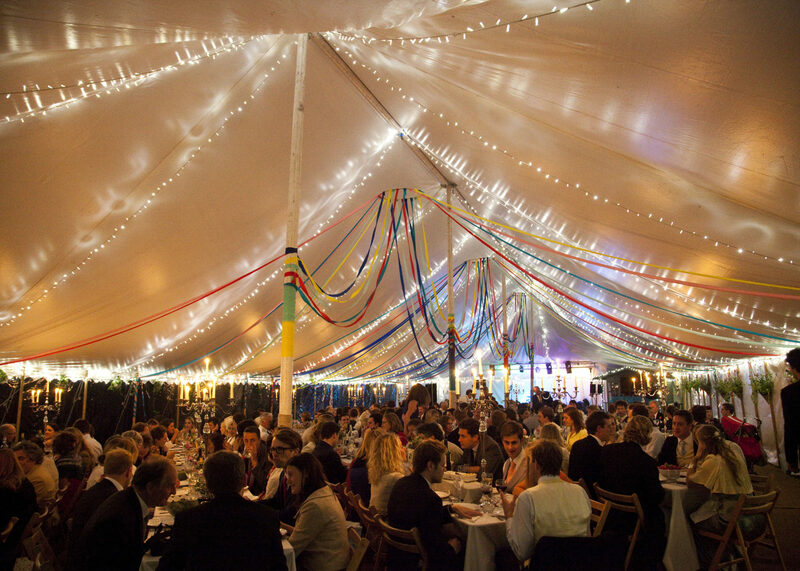 Can you heat a marquee in winter if it is cold? 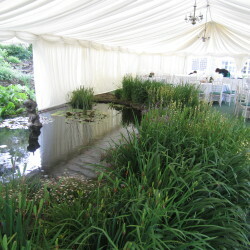 How long could I keep the marquee for? 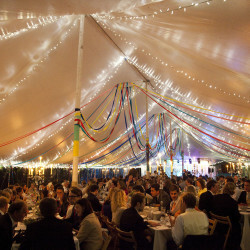 Most events happen at the weekend, for which a typical scenario would be to erect on the Thursday and remove on the Monday. 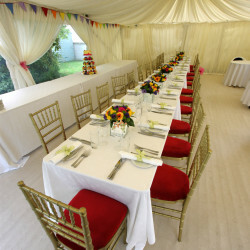 Depending on the amount of notice we are generally happy to give you an extra day or so at no extra cost, allowing you to arrange another party or a charity event on say the Wednesday night before or Monday night after. Our flexibility diminishes in the high season (June to September) and with less notice. Yes. 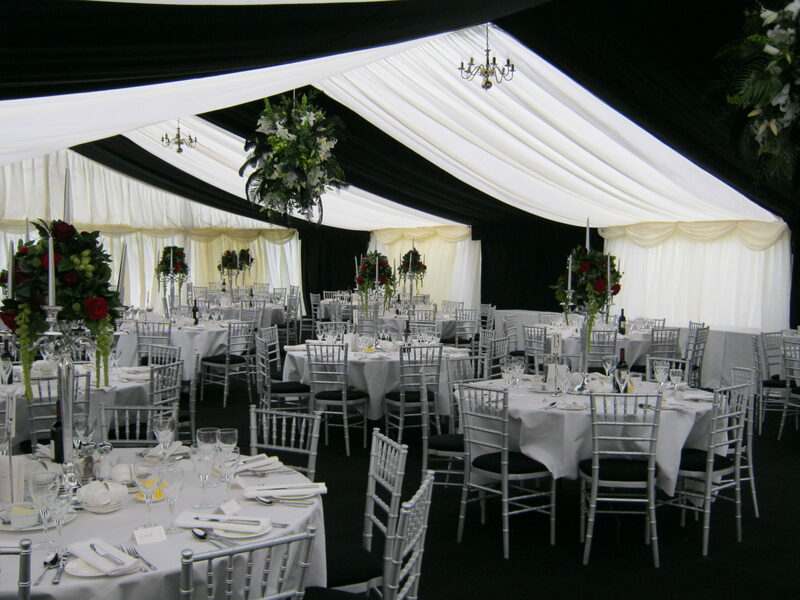 We can arrange for any kind of toilet to be delivered to a site, from a builders’ style portaloo to a luxury unit for a party for 500 people. 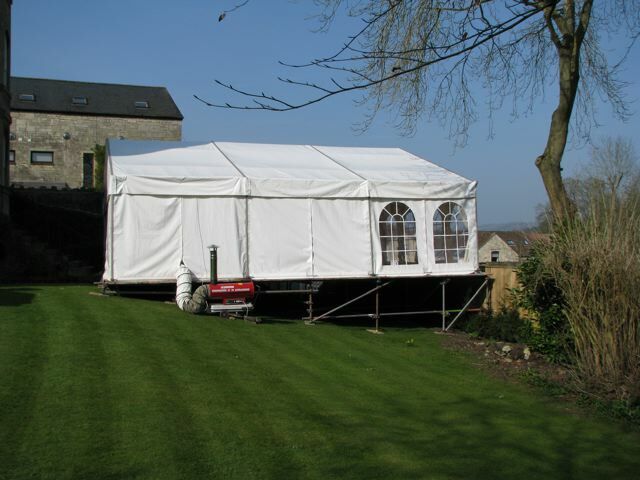 We have excellent relationships with several local portable toilet companies from whom we sub-contract, so we can advise you on the best option to suit your event and budget, and we will work with them to arrange the best location and delivery time. I have a tree in the middle of my lawn. 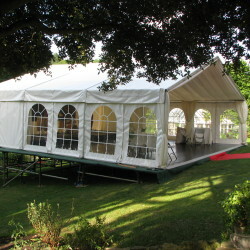 Could this fit inside the marquee? Yes, depending on its size. 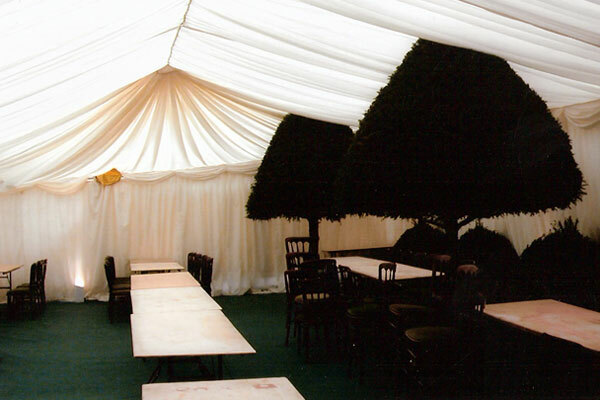 The highest point of a 12m marquee is around 4.5m high, and a 9m marquee is just under 4m high, so if the tree is shorter than this (and not too bushy) then it should be able to be accommodated. We would always recommend a site visit to discuss these type of issues. 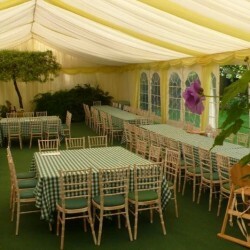 Are your marquees cheaper in the summer or winter? Due to demand we can often offer good deals during the winter months. 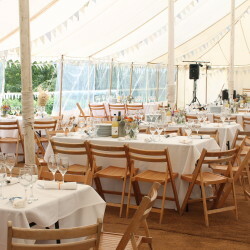 You will need to bear in mind that these may be offset to a degree by the cost of items such as heaters, although generally we would advise that you would save money by staging your event in the winter.